Hemingway and a Zenith Tranoceanic? 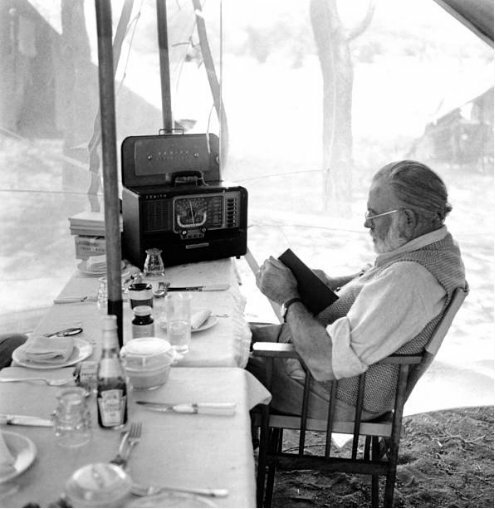 In a Twitter exchange yesterday @dean_frey shared the photo above of Ernest Hemingway on Safari in Kenya in 1952. I believe this may be a Zenith Transcoceanic model H500. Could a Transoceanic expert in the Post community confirm of correct me? Please comment! I know this: I love Earl Thiesen photos. Check out Dean’s twitter feed for other vintage photos. This entry was posted in News, Nostalgia, Vintage Radio and tagged Dean Frey, Earl Thiesen, Earnest Hemingway, Zenith Transoceanic on March 30, 2017 by Thomas.